Shades EQ is the best demi-permanent color for those who do not want damaged hair. This amazing color line will allow you to enjoy the hair color that you long for but without a permanent commitment. 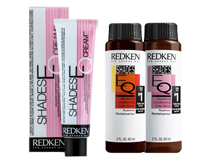 Shades EQ hair color will enrich your natural hair color, leaving it more vibrant. It will also condition your hair and add amazing shine. It's an exceptional product for blending gray and correcting color. 100% Gray Coverage! 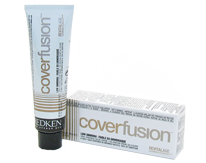 Cover Fusion's formula is designed to cover hair that is 50% white or more and to target concerns of white hair including lack of strength, shine and condition. The low odor, low ammonia formula is enriched with argan oil to protect hair from the effects of aging and free radicals. The perfect amount of brown background provides the coverage, depth and warmth necessary to give a balanced, covered result at each level. 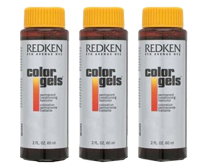 Redken Color Gels is infused with high quality ingredients that will give your hair a boost. Color Gels is a reliable and dynamic hair color brand for any shade of pigmented hair. Use it to brighten, darken, change or correct, or for highlighting and creative color effects. This amazing color also provides exceptional gray coverage. 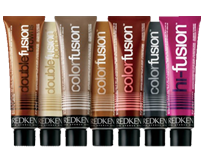 Color Fusion is a professional, permanent color cream that delivers healthy looking multi-dimensional hair color. It has amazing durability, control, conditioning and shine. Color Fusion can be used to lighten, darken, match natural hair color, or to cover gray. 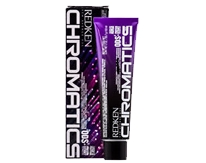 Whether you need to cover gray or just want to enrich your current color, Redken Chromatics will give you the beautiful, polished color you are looking for, with revolutionary results. Unlike other hair color formulas, Chromatics has zero ammonia and zero odor and actually fortifies and strengthens the hair cuticle instead of damaging it, leaving it up to two times stronger. You will have shinier, healthier-looking hair and amazing color after just one visit at our hair salon in Plymouth MI. Formulated just for men! 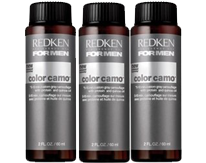 Redken for MEN Color Camo 10 minutes Camouflage Color covers up fast. Color Camo takes gray undercover and turns back time in 10 minutes! Permanent dye technology with demi-permanent results, gray is camouflaged and naturally blended. This color that will fade over time, and become lighter with each shampoo. It is designed specifically to give men a very natural looking, believable hair color.